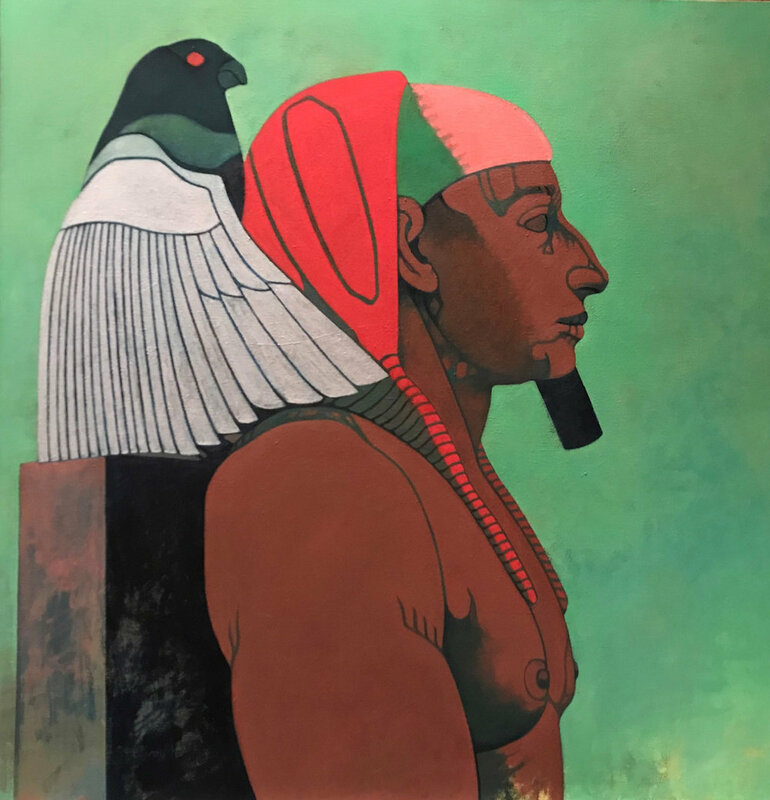 Khafra and Horus (The Falcon God) Oil on Canvas 48 x 48 in. Dee Levinson's fascination with religion is revealed in a new series of oil paintings that attempt to capture part of the essence of a religion through individual portraits, symbolism and signs. The lines in Levinson's portraits are bold and decisive, lending a sculptural depth to the subjects of her paintings. 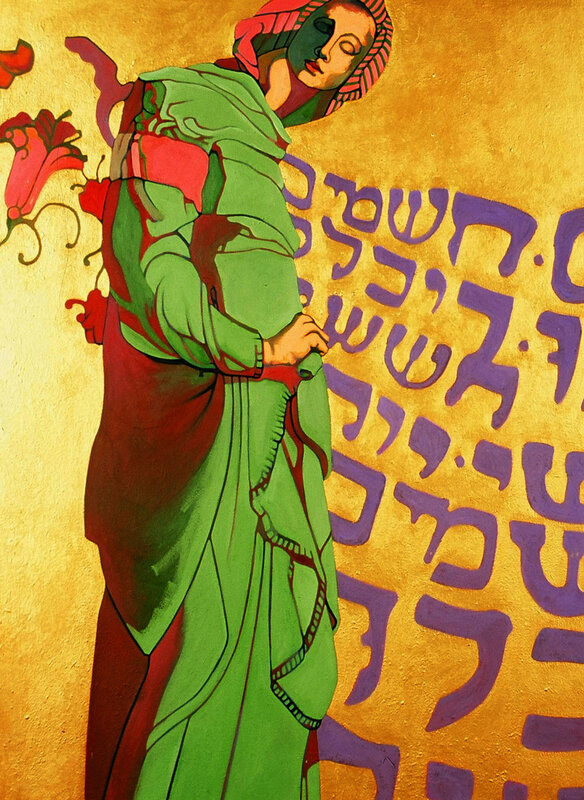 Along with her saturated colors that are mainly “double split complementary”, the paintings echo the transcendent quality religions embody. On a trip to Rome, Italy in 1991 Dee Levinson photographed everything she saw that interested her, from the Palantine Hill to people she came across, ancient sculptures in the forum to horses in the Borghese Gardens. She then proceeded to work from her images, trying her hand at all she had seen. In the end the images of sculpture were the most successful and satisfying for her as a painter thus her run on sculpture began. Levinson’s use of brush strokes transforms plainly colored sculptures and allows us to enter a magical world of color and myth. “First came the early Jewish prophets, Amos, Hosea and the first Isaiah, declaring that they had heard the Word of the Lord claiming their obedience and demanding a new level of righteousness and justice in the life of Israel. Then in Persia the great prophet Zoroaster appeared; China produced Lao-tzu and then Confucius; in India the Upanishads were written, and Gotama the Buddha lived, and Mahavira, the founder of the Jain religion and, probably about the end of this period, the writing of the Bhagavad-Gita; and Greece produced Pythagoras and then, ending this golden age, Socrates and Plato. Then after the gap of some three hundred years came Jesus of Nazareth and the emergence of Christianity; and after another gap the prophet Mohammed and the rise of Islam. The suggestion that we must consider is that these were all movements of the divine revelation.” Hick, An Interpretation of Religion: Human Responses to the Transcendent, 1989, p. 136. Miriam - Sister of Moses Oil on Canvas 48 x 36 in. The Lamb of God Oil on Canvas 30 x 30 in.